A Kenyan science teacher named Brother Peter Tabichi has won a global prize for teachers. Brother Peter Tabichi is called an "exceptional teacher" who gives away 80% of his salary. He has won a $1 million prize (£760,000) as the world's best teacher. Please Share this Inspirational Story to Encourage others! Br. 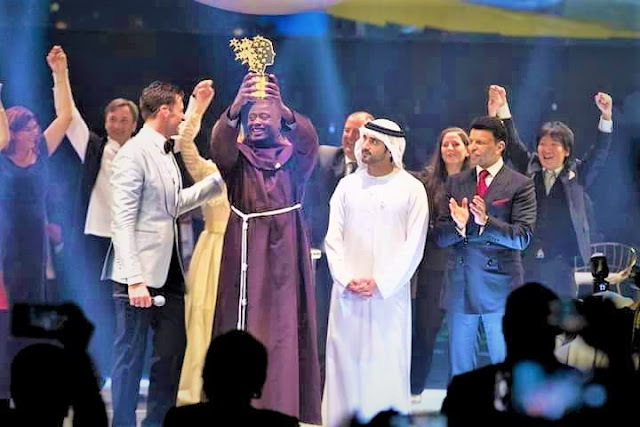 Peter Tabichi, a member of the Franciscan religious order, won the 2019 Global Teacher Prize. The award, was presented in a ceremony in Dubai, it acknowledges the "exceptional" teacher's commitment to pupils in part of Kenya's Rift Valley. He gives away 80% of his pay to support pupils, at the Keriko Mixed Day Secondary School in Pwani Village, Nakuru. These students are very poor and often could not afford uniforms or books. The competition is run by the Varkey Foundation, had 10,000 other nominations from 179 countries. Br. Peter is member of the Catholic religious order founded by St Francis of Assisi in the 13th Century. He teaches in groups of 70 or 80, in overcrowded classrooms and this causes problems for teachers. Brother Peter shows mercy to others as a follower of Divine Mercy Jesus!